This is the first in a series of reflections on our recent trip to Rwanda and the Democratic Republic of Congo with Faith, Hope and Love Global Ministries. Presumed dead, Théoneste was thrown into a latrine filled with piles of other mutilated bodies. Having just witnessed his parents being hacked to death by genocidaires, he was barely hanging on to his own life. As he lay dying from a machete blow to his head, he drifted in and out of consciousness. Théo was just twelve years old. When night fell, his uncle who had been hiding in the forest nearby fished him out of the mass of bodies. He was still breathing and was starting to regain consciousness. Though the killers soon caught up with and murdered his uncle, Théo managed to escape. That was fourteen years ago, and only the beginning of his long journey of suffering. In one fateful day, in the midst of 100 days of genocide where over 1 million Tutsis and moderate Hutus were slaughtered in Rwanda, Théoneste had to suddenly grow up—or perish. He instantly became responsible for his three sisters, who also miraculously escaped being slaughtered. First they went to an orphanage of sorts, but soon it had to close due to lack of funds. A kind man took the four children in, but then he died. Since the deceased man’s widow simply was not able to take care of them along with her own children, they had to leave her home. On the street, they went from place to place looking for places to sleep wherever they could. When Théo was able to work, they were finally able to rent a small apartment. However, his limited income sometimes meant they had to go without food for two or three days at a stretch. Théo also suffers from headaches, and sometimes his nose suddenly starts bleeding without warning. He showed us the scar stretching across the top of his head. No doubt the throbbing and bleeding are linked somehow to the old machete wound. However, his symptoms worsen whenever he worries about where he is going to find shelter and food for his sisters. The doctor’s only advice has been for him to stop thinking about his problems! Some solution. As I listened to his story, I wasn’t sure I could handle what he was telling me. I wasn’t sure I could face the truth of the extent of his suffering and desperation. Meanwhile, there are 350,000 other orphans in Rwanda alone with their own stories. If it were not for the occasional kindness of strangers and others who are able to offer the minimum of assistance, many would die. Instead, most of them barely scrape by. All of them continue to suffer. I felt overwhelmed, and scared. If I gave my heart to him and his sisters, and gave them some money, what would he else would want from me? Would I get trapped in a relationship that would demand more from me than I could give? I had already shocked myself when some of us helped him to buy a small, three room house (not three bedrooms, but simply three small rooms under a roof that leaks, with no kitchen, toilet, furnishings, or floors). Where would his need for our help end, I wondered? And maybe even more scary to me, what toll would caring for such a high-risk family take on my heart? After listening to his story and making a plan for continuing to provide modest support for his sisters and him, we held hands and prayed together. He in Kirawandan, my wife, Jill, in French, and I in Franglais. When we stood up to leave, Théo wrapped his arms around me. As we hugged to say goodbye, he clearly did not want to let go. Jill told me that he closed his eyes and put his head on my shoulder as he hung on for dear life for at least 60 seconds. After I made a few tentative taps on his back, which usually signal that its time for the hugging to finish, I caught myself. That’s not the message I wanted to send at all. I didn’t want to let go either. 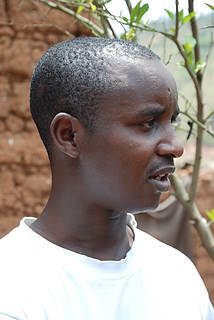 I have no illusions that I can solve the problems of Rwanda or that I can ever rescue or provide all that this young man and his sisters need. I am no hero, and in fact, my experience in Africa is showing me how small and weak I actually am. However, I am not completely powerless. I’m still not sure how well I truly can handle the harsh realities I am starting to face in Africa, but I can try to face the truth of the suffering of others. I can choose not to avert my eyes. I can open my heart and mind. I can embrace at least this one relationship.